I was noodling around YouTube recently looking at various interview segments related to Bill Frisell and Nels Cline. I posted recently about something found related to Nels, but stumbled across an interesting interview with Bill Frisell as part of the release of his 2011 release Sign of Life (see video below). Perhaps, no surprise, I am forever fascinated by the process that artists go through to create what they create. Maybe that’s why I enjoy direct interviews with artists. Oh my, where to begin...in short, a simply fantastic and entertaining interview with producer and engineer Glyn Johns (bio here and here) makes up most of episode 528 of the excellent podcast Sound Opinions. He talks about his work and firsthand experiences collaborating in the studio, and very much a part of the dynamic creative/recording process, on albums with The Who, The Rolling Stones, Jimi Hendrix, Led Zeppelin’s first album, The Kinks, Steve Miller, The Eagles, The Clash, and even the Beatles (and more, more, more--if you can believe it). Incredible. Illustrating how involved and engaged he was in his formative days, Glyn confirms in the interview that over a day to day-and-a-half period in February 1969 he worked with the Beatles on Abbey Road, did an all night session with the Stones on Let it Bleed, then flew to Royal Albert Hall to work with Jimi Hendrix. Are you kidding me? Amazing. I so admire how open and honest Nels Cline is regarding his music and his approach. I have listened to several interviews with Nels over the last few weeks and he is consistent and easy-going in all settings and is very comfortable discussing his music and influences. Read more about Nels Cline and "Sound"
How far would you go to listen to and share music? In post-WWII Russia, music appreciators would go quite far, so far that they created what is now refererred to as "bone music"—thin, makeshift bootleg "albums" etched onto used x-rays, played at 78 RPM. It was way music lovers could bypass state censorship. Read more about "Bone Music"
Ironically, before the sad news this morning regarding David Bowie I watched this documentary over the weekend. I was preparing for this week's radio show and planning on playing tracks from his latest album, Blackstar. I think, by-and-large, it presents a very interesting history and portrait of Bowie--music first and foremost, but also insights from (and about) his family and friends. It is loaded with archive footage, good footage and photos, but also features segments of interviews with Bowie, Iggy Pop, Moby, Trent Reznor, and more. Well worth watching. 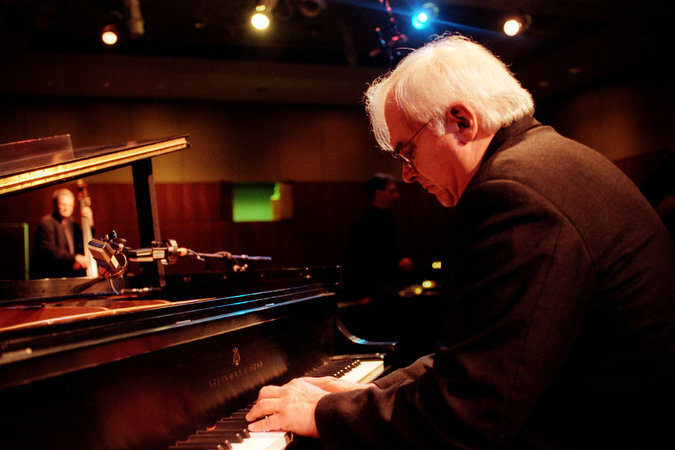 On Sunday, pianist Paul Bley passed away. Ben Raitliff wrote a very nice piece over on the NY Times that touches on many of Bley's contributions and creative achievments. He will certainly be missed. As one who is not overly familiar with Paul Bley's work and collaborations, the NY Times piece is a useful primer and guide to point me to more of his work. One of my favorite sites for all things electronic music, and more, is synthtopia. They posted a nice short piece about the origins of ambient music as described by Eno himself. It is arguable, for sure, as to where, by who, or when "ambient music" began. But, Eno is certainly a name that is often mentioned when talking about its origins. On the cusp of the new year, Epicenter, by Chris Nightcap's Bigmouth, is on another "best of" list for 2015. This time it is number one! The end of the year lists are rolling in and one of my favorite releases in 2015, Epicenter by Chris Lightcap’s Bigmouth, has landed prominently on two important “Best of 2015” lists. Nate Chinen, music reviewer for the New York Times places Epicenter at #8 on his list of the best albums (not just jazz!) of 2015.